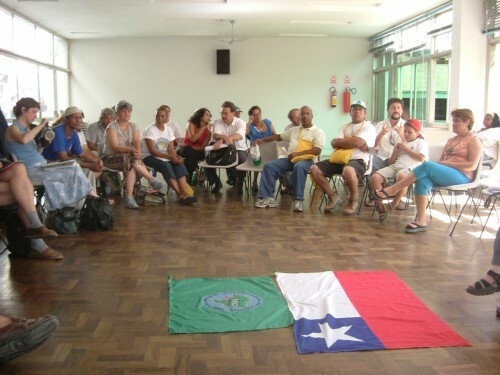 In 2005, in the City of São Leopoldo, Brazil, I had the opportunity to help gather a few leaders of waste pickers´ organizations from four Latin American countries. Who would have imagined at that first meeting that, eight years later, those same leaders and countries would be part of a network that, to date, gathers organizations from Asia, Africa and Latin America? At that time, a fledgling virtual link among waste pickers’ organizations from Chile, Argentina, Colombia, Brazil and Uruguay was emerging. The path was uncertain and spontaneous; no project or funding allowed these waste pickers to neither meet nor gather. However, the will was always stronger than the difficulties, and support from some allies came swiftly. Thus, cooperation intensified, and it became even stronger when the Avina Foundation saw the potential of this group of waste pickers who, through their daily activity helped —often without knowing it— in the care of the planet and its ecosystems. The continental scale of this alliance gave birth to a close relationship between the Foundation for Sustainable Development in Latin America and these leaders, grassroots waste pickers, who were willing to join forces to become stronger and more visible. In later years (2006-2007), there were several planning and exchange meetings. One of the characteristics of these early meetings was that the flow of ideas and wishes was most of the time bigger than the actual possibilities to materialize them. But this was never an obstacle to keep dreaming. These meetings produced the creativity and solidarity needed to maintain cohesion and enthusiasm, despite the geographical challenges that this collaboration entailed. Imagine workers, who must walk miles pulling a cart to collect and sort recyclable materials, one day boarding a plane to meet with their brothers from distant countries. Some skeptics have said, and continue to say, that keeping the struggle to improve their living and working conditions in the city is better and more productive, than wasting time with all that travelling abroad. However, there are some enterprising fighters who have said “let’s do both tasks! Let’s fight nonstop; without borders. Just like the exploiters have overcome transnational borders, we, waste pickers, too, won’t have borders in our struggle.” This was the motto of the 2nd Latin American Congress of Sao Leopoldo in 2005, and it has become the everyday emblem of many waste pickers’ organizations worldwide. After that opening cry: “NÃO HÁ FRONTEIRAS PARA OS QUE EXPLORAM…. NÃO DEVE HAVER PARA OS QUE LUTAM…,” these countries, along with a few more from the Latin American region and new allies —sharing the same interest in the organization of the waste picking sector— met in Bogota three years later to celebrate the encounter with other continents. 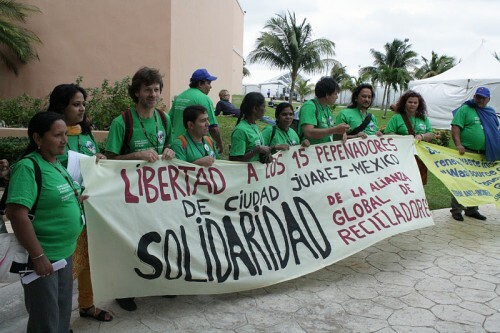 Among those allies was WIEGO —a global network gathering researchers on, and grassroots workers in, the informal economy. In total, 42 countries took part in the 1st World Congress and the 3rd Latin American Meeting of Waste Pickers. The realities shared were different, but the problems and challenges almost the same: How to achieve recognition of their work? How to improve their working conditions? Three years have gone by since those questions were posed, and it is with great joy that we now have dozens of new national movements and regional alliances of waste pickers in seven new Latin American countries (Venezuela, Ecuador, Peru, Paraguay, Costa Rica, Puerto Rico, Dominican Republic and Bolivia), in three African countries (Kenya and South Africa), in India and emerging Asian groups. In July 2009, thus, we witnessed the birth of the Movement of Waste Pickers of South Africa, the national Alliance of Indian Wastepickers, and during 2010, a national network in Kenya. Just like the more recently-created National Movements of Nicaragua and the Dominican Republic join now the many other movements formed during the course of the years 2008 and 2009. The current Latin American Network continues to be at the vanguard and is a role model for their colleagues in other regions, who see with appreciation and pride the Network’s progress on issues of national policies for the inclusion of the sector, cooperativism, strengthening of leadership, business coordination and defense of the sector. Solidarity and exchanges between countries, thus, generate mutual learning and stronger organizations that continue struggling for the same ultimate goal, which is, and will continue to be, improved living and working conditions for the sector. Recent efforts in past years have focused on the construction of an emerging world network formed by an interim Steering Committee with representatives from the three continents. The Committee has already met in Buenos Aires, Durban, Belo Horizonte and Bangkok. As a Global Alliance, they have undertaken joint actions with high impact and media visibility, including the UN events on Climate Change in Bonn, Copenhagen, Tianjin and Cancun, where for the first time a waste picker spoke to the whole world on behalf of civil society in an opening plenary. A new ally is envisioned in this new struggle against climate change and for the recognition of the work of waste pickers: GAIA, the Global Alliance for Incineration Alternatives. The challenges have changed in form, but continue to exist. Waste pickers’ lives and livelihoods still endure tramples. In some countries waste pickers continue to be murdered; in others they have been sent to prison arbitrarily; and it is common to find states implementing measures to impede their daily work. Such abuses, however, have been answered to with solidarity by the sector. Nothing better to celebrate these achievements, to denounce these abuses, and to show the world the importance of the waste pickers’ sector than to have a new website to communicate in the best possible way this organizing and coordinating path without borders.